An unfinished basement is usually functioned as a storage room because it is prone to mess, dankness, and darkness. A finished basement, however, packs a lot of fun, even a small one. 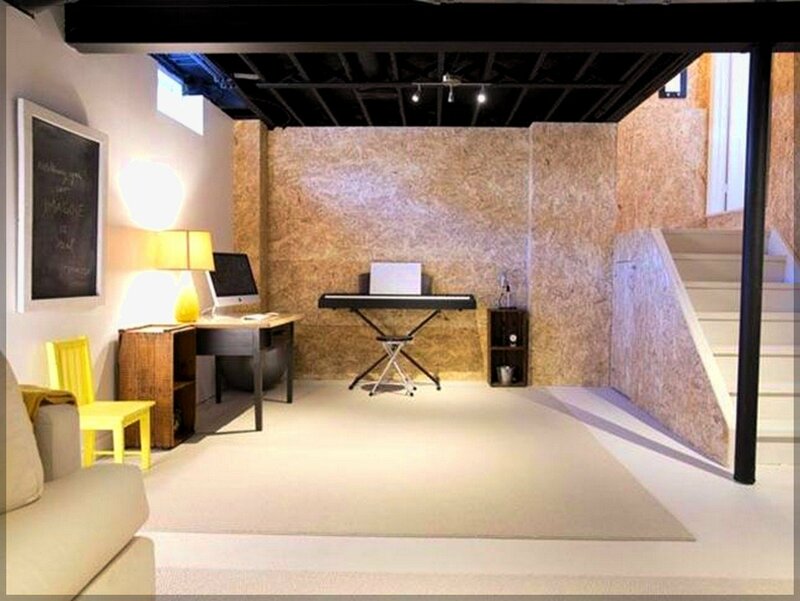 Check out these 9 stunning small basement ideas that you should not miss. 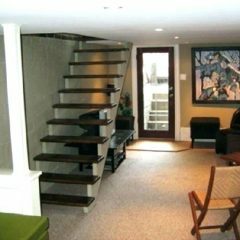 Revamping a basement can be costly. But, if you are tight in budget, don’t fret! There is always a way to turn your dark and dank basement into a comfy one without making you broke. Instead of covering the ceiling which requires extra money, you can try painting the exposed beamed ceiling so it feels like a more finished basement. Besides, it will enable you to have an easy access to the ceiling in case you need to fix the utilities. Since the basement’s floor is rather cold, you can try rolling out a rug to warm your feet up. The rug can also provide a nuance as well as defining a certain functional area in your basement. Going to a bar where you can hang out and banter withfriends is amazing. 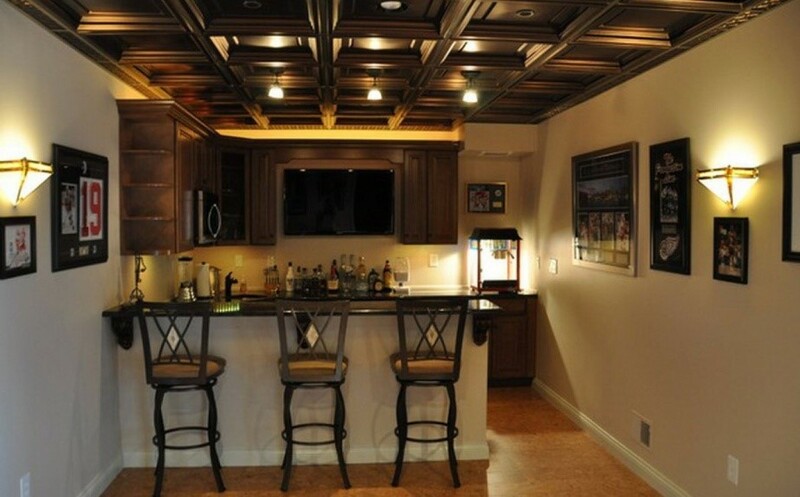 But now, you do not have to go to the bar anymore because you can have a more private bar right in your basement. This small basement is a great place to hang out in. You only need to fill your cabinets with your favorite beverages or even wine. A wall-mounted LED TV hangs between the cabinets, providing you a limitless entertainment while enjoying the wine and snacks. For a more elegant and romantic ambiance, try using dim light to illuminate the basement. Every man needs a place where they can spend some time with friends while blowing off steam. And if that is what you are looking for, basement will be a safe haven for you. 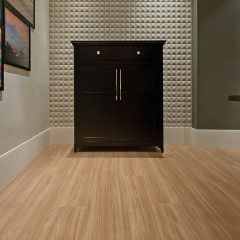 The black finish provides the touch of boldness to this basement well, enhancing your masculinity style perfectly. 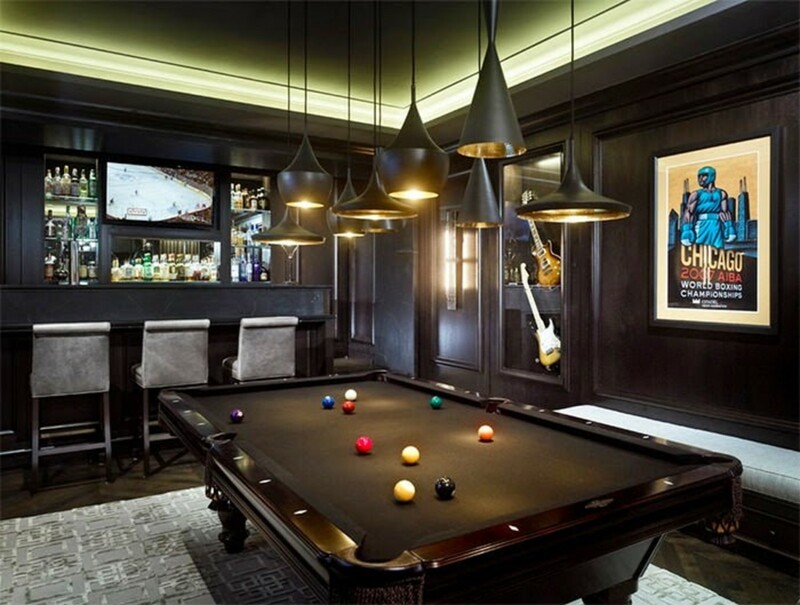 It also features a black pool table illuminated with eight black matte pendant lamps that make your game room look more elegant. When there is a pool table, a bar is available, too. Of course! They are inseparable. You are going to need to grab your favorite wine or fizzy drink in no time when playing pool game, aren’t you? Many homeowners are crazy about mid-century modern style. 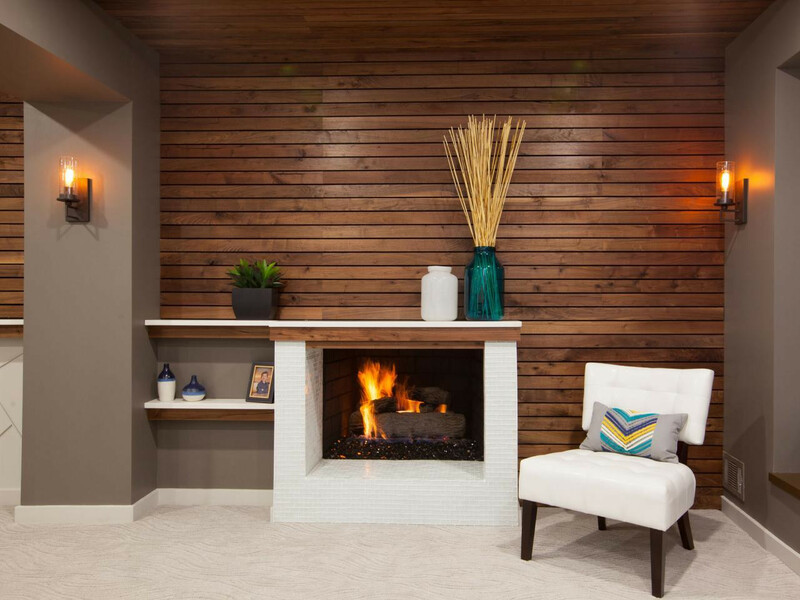 If you are one of the big fans of it, try turning your unfinished small basement into a fabulous one by implementing mid-century modern décor. To get this look, you need to keep everything simple without ignoring the harmony. Clean lines are the significant feature of this style. Therefore, ditching sophisticated accessories would be the best choice. Investing in some pieces of furniture with peg legs would accentuate this style well. To provide the ultimate comfort for you and your family, you can install an electric fireplace and tack down a soft beige carpet. The carpet will keep your feet warm and comfy. The beige color suits the décor well. Since the carpet is tacked down to the floor, you will find it hard to remove it. The beige color is prone to dirt and stain. 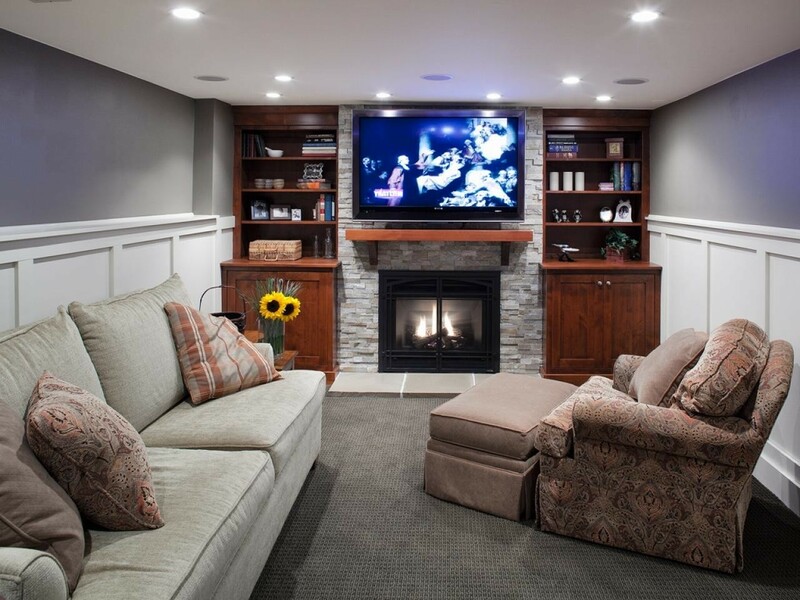 What will you do with your basement? Turn it into a bedroom? Or an entertaining room where you can watch your favorite movies? Or maybe both? Actually, you can have them both in your small basement. But, you have to keep in mind that you should not go overboard with the furniture. A simple yet functional bed would be better than a big and bulky one. 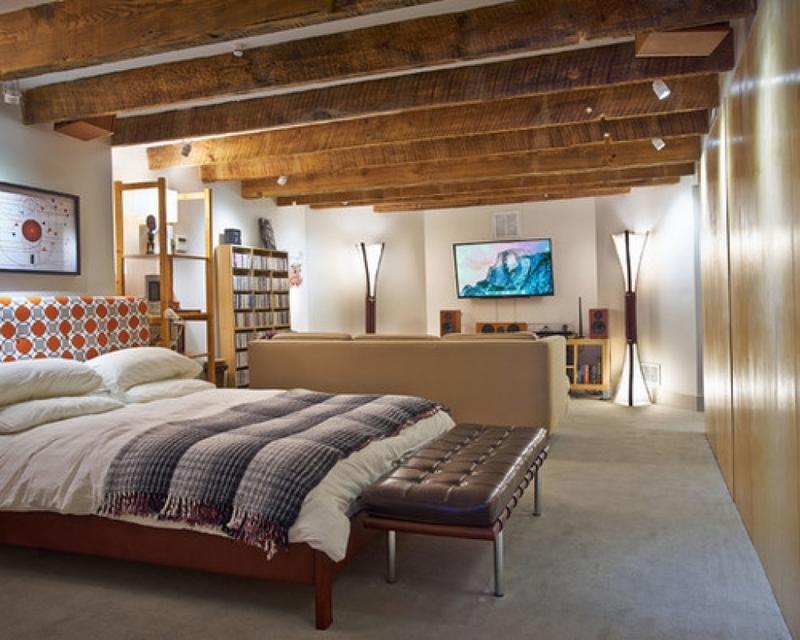 A single couch is placed next to the bed, providing a comfortable seat to lounge on while enjoying the show. Two decorative standing lamps are added to illuminate the basement as well as embellishing it. Try applying high-gloss interior paint to make your basement appear to be larger. To add the touch of rustic look, you can leave the exposed beamed ceiling that way. You deserve a “me-time” after spending your busy day at work. Sitting back and relaxing on a sofa while watching TV would be nice. And the best place to do this is in the basement. When it comes to get the best viewing pleasure, a large sectional sofa would be nice. But it would turn into the worst choice if you applied it in a tunnel-like basement. You can just go with a sofa shoved against the wall so you still have a sufficient traffic area. You can also add an armchair along with an ottoman. The ottoman allows you to spread out to be more relaxed. It also makes a great coffee table when not used. If you need an additional seat, just grab the ottoman and it will be a nice place to sit on. The TV set makes a stunning centerpiece. The arrangement of the sofa and TV set does not give you the best viewing pleasure that you have been looking for. This basement is unique. It has two entrances – one is the regular entrance inside the house, the other is the door that can be accessed from the outside. These two entrances, especially the one in the outside allow you to go to your backyard in a jiffy. 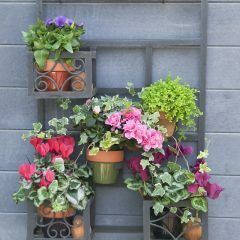 Besides, you can make it a beautiful mudroom if your boots and umbrella are wet and dirty, and you do not want to ruin the living room. If you are going to occupy your basement, you might need to consider having a bathroom in it. One of the most important things is the lighting and ventilation system since the room underneath the ground is prone to dankness. 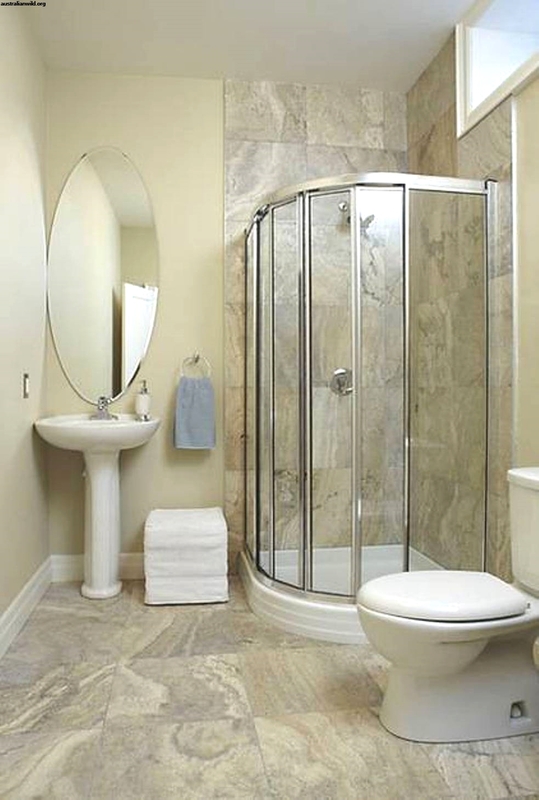 A bathroom in your basement would enable you to make a run to the bathroom when nature calls. The basement could be damper. There are many things that you can do with your basement. 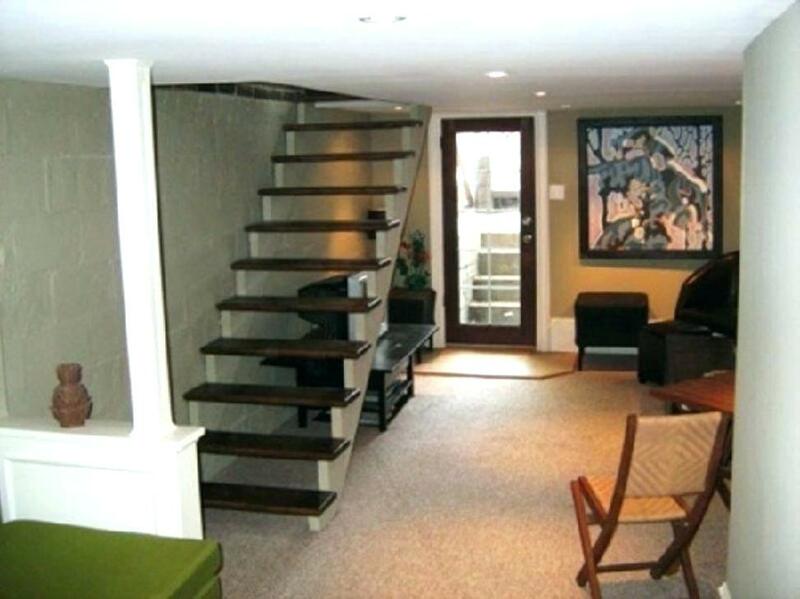 You can use one of these small basement ideas to refurbish and perk it up. You can just use them or tweak them a bit to meet your style well.